Summer Zervos, who is suing President Donald Trump in a defamation lawsuit, leaves Manhattan Supreme Court after a hearing in New York, Dec. 5, 2017. President Donald Trump walks to Marine One on the South Lawn of the White House, June 1, 2018. 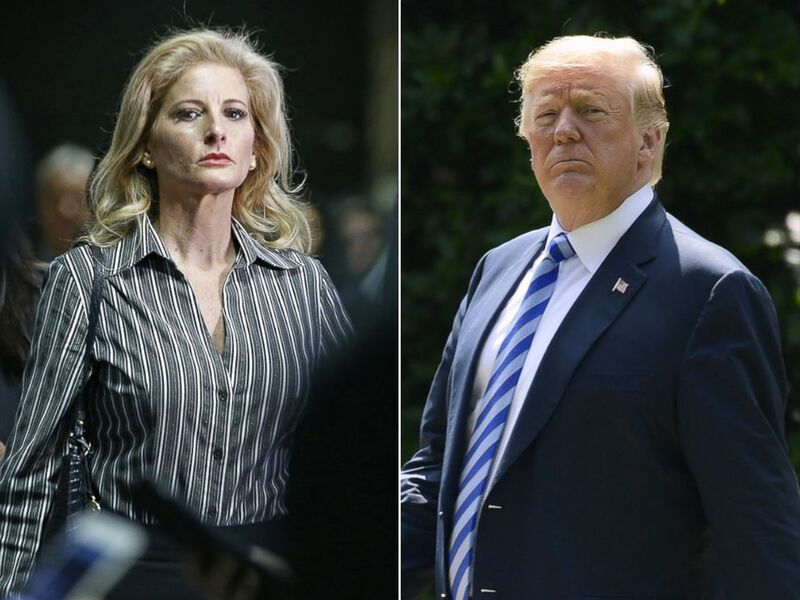 Summer Zervos, a former contestant on "The Apprentice" who's suing president Donald Trump for defamation, is requesting more information on Trump's other accusers before the lawsuit goes to trial. In October 2016, Zervos, who appeared on the reality show in 2005, made a statement alleging that Trump kissed her twice on the lips in 2007 in his New York office and groped her breast at the Beverly Hills Hotel without her consent. Summer Zervos speaks to the press with her attorney Gloria Allred on Oct. 14, 2016, in Los Angeles. Trump's "immediate response" to Zervos' claims was, according to court documents: "To be clear, I never met her at a hotel or greeted her inappropriately a decade ago. That is not who I am as a person, and it is not how I've conducted my life." Zervos filed the lawsuit in January 2017, just before Trump's inauguration, alleging that Trump made defamatory statements when he accused her and other women who made similar allegations of lying while on the campaign trail. "In an effort to convince the public that Ms. Zervos supposedly had lied about his groping," court documents show, "Defendant did not merely deny the truth of the specific facts she reported. He went further, attacking her by stating falsely that she had lied for fame or to aid his political opponent." Summer Zervos is pictured on an episode of the fifth season of "The Apprentice" that aired on Feb. 27, 2006. In court documents filed Tuesday, Zervos and her legal team requested pre-trial evidence from the dozen other women who've reported similar accounts of sexual misconduct by Trump as well as "any other women who have made such complaints to or about" Trump, either privately or publicly. The information is relevant to proving Trump "made his defamatory statements with common-law malice" and that he acted with "actual malice," according to the lawsuit. Since Trump "insisted unequivocally that he had never inappropriately touched any woman," information on his other accusers would be "directly relevant" to see "whether his statements about Ms. Zervos were substantially true as a whole," the court documents state. Summer Zervos, right, a former contestant on The Apprentice, leaves New York State Supreme Court with attorney Gloria Allred after a hearing on the defamation case against President Donald Trump in Manhattan, Dec. 5, 2017. In addition, the information requested is "potentially relevant" because "of the distinct patterns of behavior that have emerged," such as "luring women to the Beverly Hills Hotel under false pretenses" and "groping women in the precise manner described the 'Access Hollywood' tape," according to the lawsuit. "Information about these other women is material and necessary to rebut the defense that each of the defamatory statements was substantially true," the court document states. In May, an appellate court in New York denied the president's attempt to put the defamation lawsuit on hold as he sought to have the case dismissed. Attorneys for Trump and Zervos sparred earlier this year over the Trump campaign's refusal to turn over any documents of other women who may have accused the president of inappropriate behavior. In June, New York State Supreme Court Judge Jennifer Schecter said that certain documentary evidence be produced by September and that depositions of Trump and Zervos be completed by Jan. 31. Trump's attorney, Marc Kasowitz, has argued that the Supremacy Clause of the U.S. Constitution bars a state court lawsuit against a sitting president. "This issue will likely reach the United States Supreme Court," Kasowitz said on June 12. Zervos is asking for "special damages" of about $3,000, plus damages for emotional harm and loss of business, in addition to punitive damages. ABC News' Aaron Katersky, James Hill and Lauren Pearle contributed to this report.